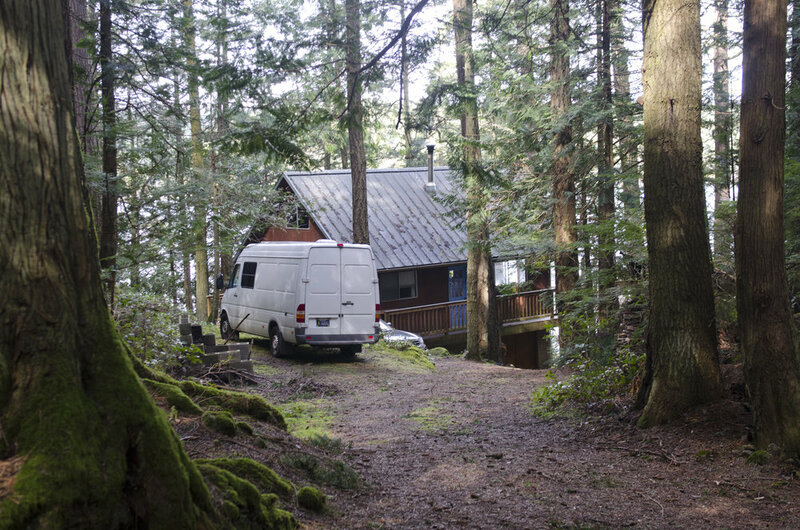 The San Juan Islands have a lot of great AirBnBs and there's just something lovely about staying in a cabin in the woods, preferably with a sea view. We were lucky enough to be able to stay at a little cabin on Shaw Island that Justin's grandparents have owned since the 1960s. The cabin was actually located somewhere else and when Justin's grandparents purchased a parcel of land on Shaw, they disassembled the cabin, moved it there, and reassembled it! One of the best things about the cabin is how close it is to the water. These days building codes prevent houses from being built super close to the water. When Justin was studying for the MCAT exam to get into medical school, he spent a month at the cabin on Shaw and swears that it was one of the best months of his life. The San Juan Islands are a great place for cycling if you don't mind hills. Although there aren't any areas with designated bike lanes as far as we know, traffic is so minimal on even the bigger islands that it's not a big deal. We cycled for close to an hour on Shaw and didn't see a single car the whole time. What makes the San Juans really fun for cycling is that once you've purchased a ferry ticket you can ride the inter island ferries for free as many times as you want as long as you don't take on a vehicle. That means you can walk on with your bike and go explore other islands. Our second day on Shaw, Justin and our friends caught the ferry to Orcas Island and spent the day cycling. Another fun option that we considered was walking on with our bikes and camping gear in backpacks to spend the week bike camping on various islands. The weather looked like it was going to be pretty rainy though so we opted for the cabin instead. 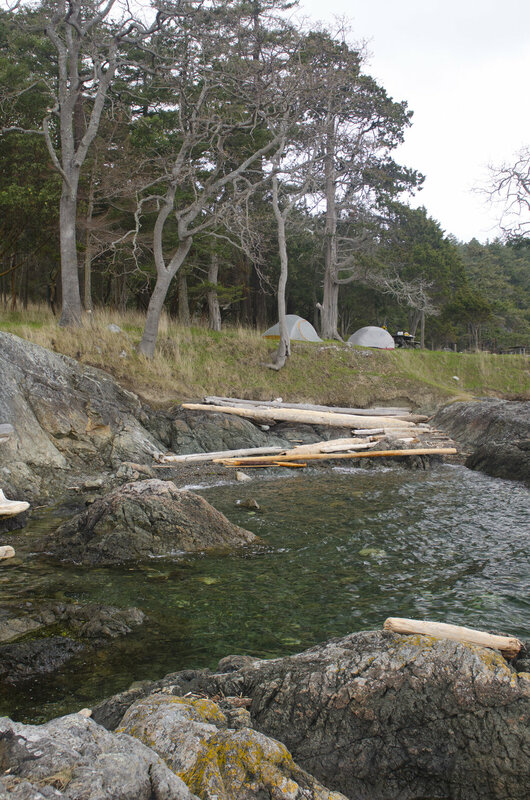 The San Juan Islands have some great hiking that's suitable for all fitness levels. For inspiration, check out Seattle Times outdoor editor Brian Cantwell's five favorite hikes on San Juan Island and the maps and descriptions for hikes on various islands provided by this San Juan Islands guide website. 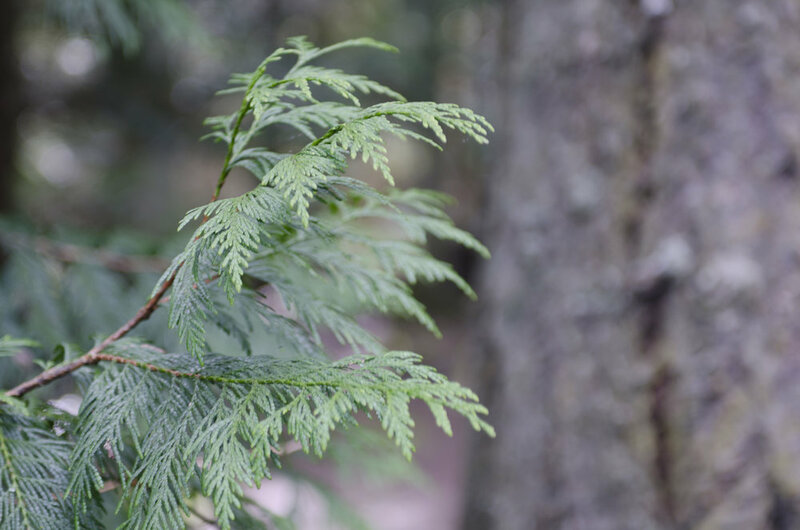 Most of the hiking we've done has been on Jones Island and Shaw Island at the Cedar Rock Biological Preserve managed by the University of Washington. If you love animals, the San Juan Islands are an excellent place to get your wildlife fix. From watching deer swim between islands to catching glimpses of seals and otters, the San Juans are sure to delight. I can't think of a single time we've gone kayaking and not seen several seals. The San Juans are also a great place to see orcas during May through September. On this particular trip we saw some very bold raccoons on Jones Island. If you're into birding the San Juan Islands, which boast over 200 species, are considered by many birders to be one of the premier birdwatching areas in the state. Kayak camping was the highlight of our trip. We've done a lot of camping but never kayak camping. Since we had some sea kayaks at our disposal, we planned an overnight trip to Jones Island State Park to wrap up our trip. After looking at maps and securing our gear in dry bags in the kayaks, we set forth from the beach at the cabin. While there were some decently large channels to cross, we never lost sight of land which I found reassuring. One thing to keep in mind when kayaking in the San Juans is that its geography produces some very strong currents as water rushes between the islands during the transition from low to high tide and vice versa. As low tide approaches water is moving away from the mainland and back out to sea (ebb current), while as high tide approaches water is flowing towards the mainland (flood current). Most places reach a peak high tide and peak low tide every six hours, so two peak high tides and two peak low tides in each 24 hour time period. There are two ways you can handle the tide. Either look at a tides and currents chart to determine when the tide is flowing in the direction you're paddling and launch during that time or plan to leave during the slack, which is the time between ebb and flood currents when water movement is minimal. If your route will be cutting across a tidal current (so neither with or against the direction of the current) it may be best to head out during the slack unless you want to use the current the pull you diagonally towards your endpoint. In general, the slack tide occurs one hour before and one hour after the peak low or peak high tide. After reaching Jones Island, which ended up taking us a while due to a strong headwind and choppy water, we paddled around the perimeter until we located the campsites on a perfect half moon bay. After beaching we hiked around for a bit checking out all the campsites to make sure we picked the best one. Since it was the offseason, there wasn't a single other person on the island so we had our pick and ended up settling on a site on a grassy promontory. We actually brought some firewood and were glad because it was around 30F and windy. 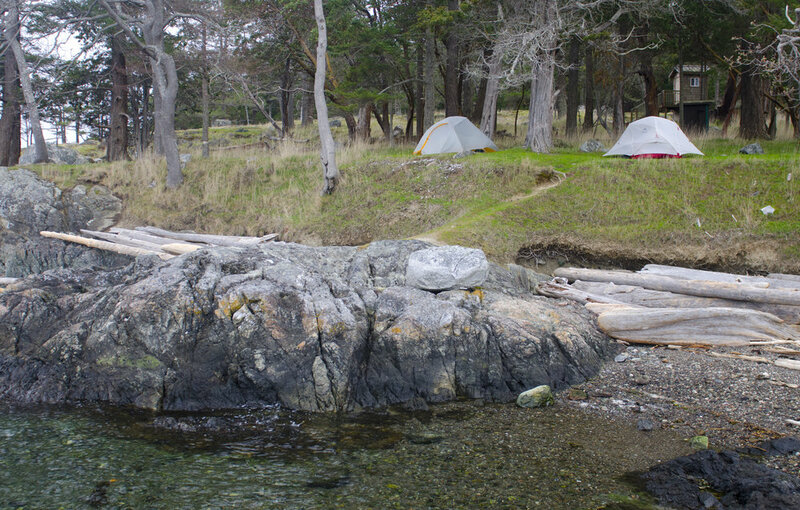 After getting a fire going, we pitched our tents on a knoll overlooking the water. Talk about an amazing view right from your tent door! While we were eating dinner Justin happened to get up to check on something and spied a raccoon making off with one of our bags. We knew there were raccoons on the island and had already secured most of our food, but apparently, there was a granola bar or something in that bag and the raccoons had decided to make off it with. After that, we secured everything but they continued to lurk around in the trees and grass around the campsite. The next morning was pretty dreary with heavy cloud cover but less wind, so we ended up having a much easier time paddling back to Shaw. It was a super short experience but definitely whet our appetites for more! If you're interested in kayak camping in the San Juans but don't have access to sea kayaks or are concerned about doing it on your own, consider going with a company like Outdoor Odysseys. 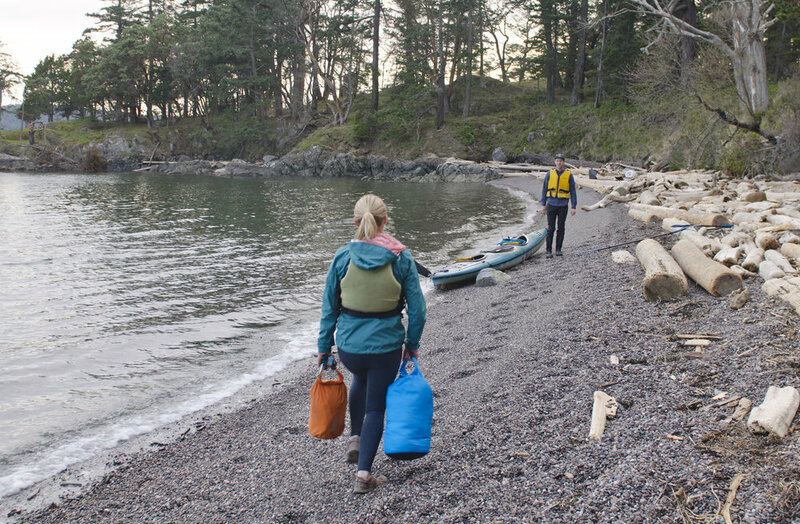 You can also rent kayaks in Anacortes or Friday Harbor if you'd rather do it on your own.